My interest in moving pictures began as a child with my family's super-8 home movies. We were still using film when I was at high school and I loved editing with a splicing machine (that's how old I am—I was around when the term "cut" was literal). During my years as a nurse I was involved in a few video projects. The first serious video I ever made was called Burnout: Awareness and Intervention from 1986, produced in my hospital's ground-breaking Betamax production studio. When I left nursing I worked for some time as a musician and sound engineer. At the same time I learnt more about camera work and video editing, eventually deciding to make video production my main career focus. With my brother Richard (AKA Scratch), we set up our own S-VHS studio and spent a few years doing corporate videos, weddings, music & event coverage. In the mid-nineties Scratch went overseas and I took up contracts with TV1 and TV3 as a freelance camera operator (stringer). For a couple of years I covered news stories from around the Manawatu, including the Motua Gardens protests of 1995. Working in news was a fantastic experience but it was very demanding. Once the novelty of watching my work on primetime TV had worn off, I started getting sick of the difficult hours and being constantly on-call. In the end I gave it up, which is a decision that still causes me the odd pang of regret but it was the right move. 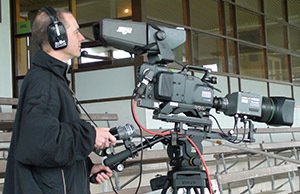 Largely for practical reasons I went to work for the TAB's Trackside Channel in Palmerston North. Initially I didn't see this as much of a career move but in fact it turned out to be perfect. I trained in all areas of outside broadcast production, culminating in my promotion to OB director in about 1997 (pictured right—me directing and Scratch on CCU). In 2000 after my move north, I continued working as a director for a while but gradually scaled down my role in order to concentrate on my website projects. These days I continue to produce videos for my own websites, as well as oversee our TATV community media project.